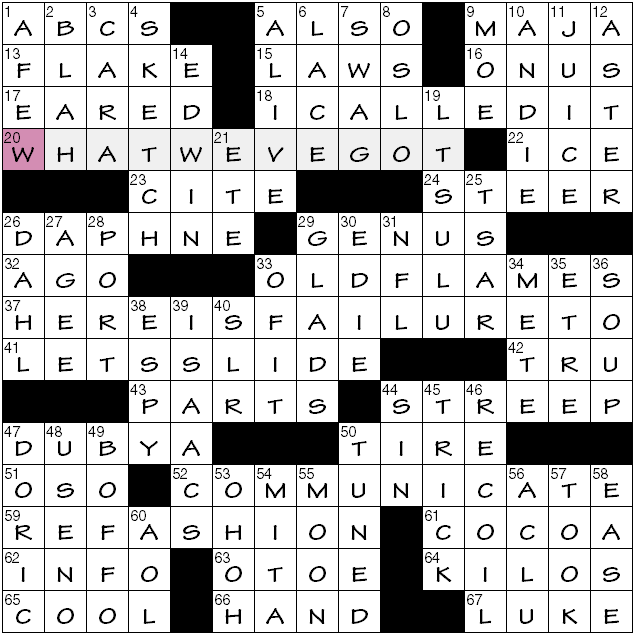 Second crossword I’m seeing and writing about that celebrates—if not explicitly acknowledges—the 50th anniversary of the release of Cool Hand Luke. The other one is the Chronicle of Higher Education offering from 27 October. 20a/37a/52a. [… #11 on the American Film Institute’s “100 Years … 100 Movie Quotes” list] WHAT WE’VE GOT | HERE IS FAILURE TO | COMMUNICATE. Length breaks down inconsistently with the sentence structure, alas. Such things are sometimes necessary in the cutthroat symmetrical world of cruciverbalism. 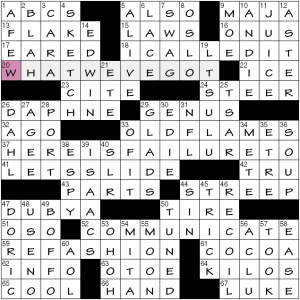 Then along the bottom row: 65a/66a/67a [… source of this puzzle’s theme quote] COOL | HAND | LUKE. 3×4, nice observation. Acrosses nearly as long as the two shorter theme-quote entries: 18a [“Told ya!”] I CALLED IT, 33a [Former lovers] OLD FLAMES (just after 32a [In the past] AGO), 41a [Accepts begrudgingly, as a minor flaw] LETS SLIDE, 59a [Make over] REFASHION. 6d [One poked through the eye?] LACE. Took me a few beats to understand this one. Not tatted or intricate lace material, rather a shoelace. Aglets and such. Seems like a lot of personal names. Let’s list them to pad the write-up, shall we? 26a [“Rebecca” author Du Maurier] DAPHNE, 44a [Meryl who played Margaret Thatcher] STREEP, 47a [43rd U.S. president, informally[ DUBYA, 9d [“The Simpsons” bartender] MOE, 10d [Actress MacDowell of “Four Weddings and a Funeral”] ANDIE, 14d [Olympic hurdlerMoses] EDWIN, 19d [Shipmate of Capt. Kirk and Mr. Spock] LT SULU, 26d [Author Roald] DAHL, 27d [PulitzerPrize-winning author James] AGEE, 30d [“The Sopranos” Emmy winner Falco] EDIE, 39d [Susan with the 1978 best seller “Compromising Positions”] ISAACS. At least a decent percentage of them are women. Guess it’s good that 13a FLAKE wasn’t clued as the Arizona senator and 42a TRU didn’t evoke Capote’s nickname, or that 3d CARA didn’t reference the actress Irene (she hasn’t done much in the past decade). See? A very lot. 12d [Fall bloomer] ASTER, 29d [Alternatives to mums] GLADS (chrysanthemums, gladioli). 17a. [Saber-rattling] THREAT OF WAR. Before knowing the theme, I had this as THREATENING. 45a. [Romantic triangle figure] THE OTHER WOMAN. 60a. [End up just fine] TURN OUT WELL. A natural choice for the final theme entry. Seems kind of random for a theme. Other erstwhile mis-fills: 7d [Sch. before junior high] ELHI not ELEM (obviously I didn’t read the clue closely), 29d [Edmund who plaayed Kris Kringle] GWYNN not GWENN, and the one that lasted the longest because I never checked the crossings until the puzzle was completely filled and there wasn’t a ‘correctly solved’ flag: 59d [Hearty bowlful] SOUP not STEW (yes that’s where the revealer ended up hiding from me). But! I at least had the good sense to hedge on 23a [Carry on wildly] as RA–– until it was evident whether it was RANT OR RAVE. Sure, there are some uncommon words and names in this grid, but at least they’re crossword familiar (e.g., MEL | OTT, EDO – 16a, 36a, 62d). 26d [“Sprechen __ Deutsch?”] SIE, Oder, ‘Können sie Deutsch sprechen?’ Etwas besser. 51d [ASAP, to an MD] STAT. Shortening of Latin statim, ‘immediately, without delay’. 52d [Brownish purple] PUCE. From French word for flea, ultimately from Latin. 41a [Truckee River’s lake] TAHOE, 67a [Giggly sound] TE-HEE (presumably this only occurs when one is in a TEPEE). The puzzle posted later than usual, so I will make this quick. Our theme entries are common phrases in which the first word can also be a part of an airplane. Yup, that all works. Although, technically, I’d say a flap is part of a wing. I do love the entry WINGDINGS and its clue. 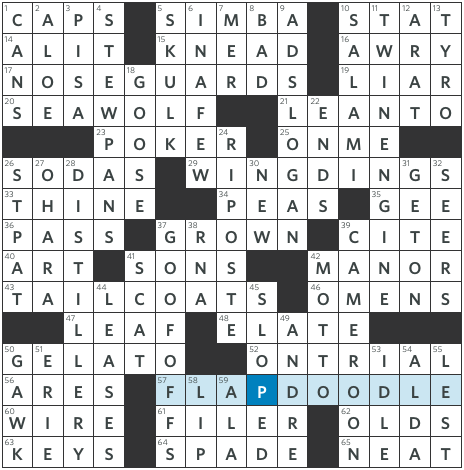 I believe I’d heard FLAPDOODLE before, but wasn’t sure of its meaning. I had assumed it meant something like hullabaloo, but it means merely nonsense or hogwash. I solved while the TV was on, so that might explain some of the difficulties I was having: CAMBODIA for CAMEROON (wrong continent, sorry), IN A SEC for IN A FEW, but worst of all GEESE for GOOSE [Flyer in a V formation]. I missed the fact that it wasn’t plural. The upshot of this was that the central upper left was a real bear for me. I didn’t know SEAWOLF [U.S. Navy nuclear sub class] nor STEWPANS [Cassoulet cookers] and POKER was impossible to see with my error and the unexpectedly-tougher-than-Monday clue [Hand-to-hand combat?]. Good clue though, but it took a few seconds post-entry for the meaning to seep through. I like the word SKULK, too. Other goodness: DISTILLERY, GOOF-OFFS, CAMEROON, posh-sounding RIPOSTE, and theme-adjacent TWIN-ENGINE. Straight-over-the-plate theme, but lively, clean fill throughout. One has to be UNRELENTING [14a: Tenacious] sometimes, not to cry UNCLE [2d: “This is too hard!”]. Lots to TANTALIZE [26d: Beguile] solvers in this themeless, and little to SNORE [7d: [How lame]] at. That said, there were a few MARE’S NESTS [53a: Difficult situations] in the grid that took me more time than usual. A [41a: Digital Trojan Horse, for one] is indeed a THREAT, but for a clue that specific I wanted something like VIRUS or CYBERATTACK. And instead of GREEN PAINT, we have [12d: Green rock]: JADE STONE, plus two other somewhat arbitrary adjective-noun combinations: [32d: Colorful Mars candy piece]: RED M AND M and [45a: Marco Polo’s home? ]: POOL AREA. As in Marco Polo, the game you play in the area of a pool. Apparently the Russians have overtaken the ARABS as top [42d: Oil suppliers]. I eat in diners all the time but I have never seen, nor has it ever occurred to me to have [19a: Diner orders that are two eggs, hash browns, and a hamburger patty covered with chili and cheese]: SLINGERS. It’s both ? and ! There’s an extremely accurate and reliable internet quiz that you can take to find out which punctuation mark you are. I am “quotation marks” because apparently I am “a reflective and gentle soul who enjoys curling up with a good book.” Uh, okay. 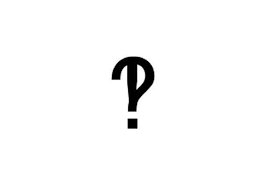 If you take the quiz and find out that you are the INTERROBANG [48a: Two-in-one mark], let us know in the comments. This entry was posted in Daily Puzzles and tagged Brendan Emmett Quigley, Daniel Hamm, Mark McClain, Mike Shenk, Peter A. Collins, Peter Collins. Bookmark the permalink. finally got a NYT subscription! COOL theme today even though I’ve never seen the movie. Anyone else want CIDER at 61a? That held me up for a while – we have some local orchards and farms that make some incredible ciders this time of year. Must have been stuck on my mind. Dubya is a disrespectful turn for George W Bush. It’s like referring to the 44th president as Hussein. Snarky leftists should keep their pettiness out of the puzzles. It was a mediocre Monday regardless. I don’t believe they’re equivalent. If you say just ‘Hussein’ nobody thinks of BHO but if you say ‘W’ or ‘Dubya’ there’s no question who that means. And is it really disrespectful or simply overly familiar? 43 certainly played up his aw-shucks character. There are plenty of snarky, nasty names for 43, and DUBYA certainly isn’t one of them. It was always a way of distinguishing him from Bush, Sr. while simultaneously recognizing the aw-shucks character he always played up. that sounds like the defense a Snarky Leftist would mount! ? honestly, jim hale, GWB is more respected and loved now by “leftists” than he has been in years. his own appreciation for a well-placed folksy barb is part of the reason why. FORGET IT JAKE / ITS CHINATOWN breaks up nicely into 13s. I once made a puzzle based around that but it was not accepted by the NYT, since the theme was too “straightforward.” I guess the policy about building a puzzle around a single movie quote is different now. Of course, my puzzle also had Roman Polanski’s name in it, so it might have been rejected today for different reasons entirely. 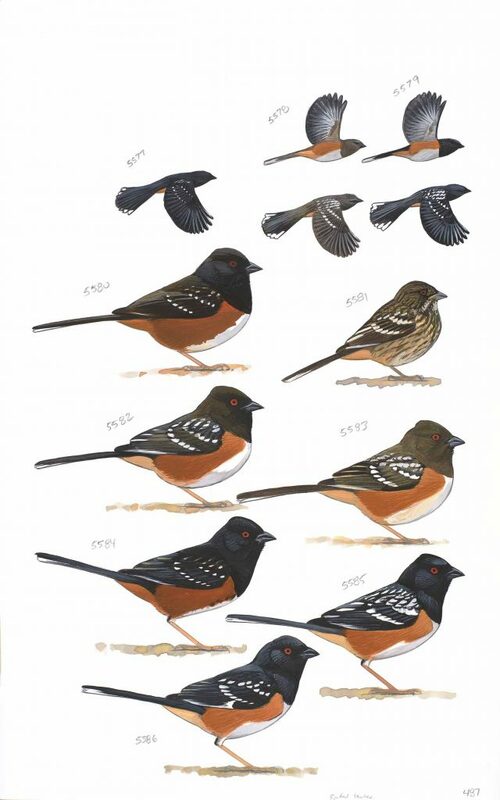 LAT made me think of a towhee as well. Good BEQ today. 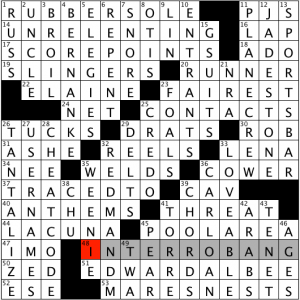 I learned a new word in INTERROBANG!/? But REDMAANDM, though it didn’t cause much of a snag was sort of roll your own. Would’ve considered either GREEN M AND M [Rumored aphrodisiac candy] or TAN M AND M [Candy discontinued in the mid 1990s] slightly less arbitrary. ‘Kicks’ can be slang for sneakers/trainers. Hi Laura – According to the punctuation quiz, I also am “quotation marks” and enjoy curling up with a good book but I would like to read something other than the recommended book (“The Picture of Dorian Gray”) since I think twice is enough for that book. I took the quiz four more times, changing one thing at a time, and gave up after “exclamation point”, “question mark” twice, and “comma”. No interrobang. I read “The Little Paris Bookshop” for a book group; that book had a character who was a literary apothecary, who prescribed particular books for the reader’s problems/personality. Meh otherwise (my opinion, ymmv) but the booklist was interesting. 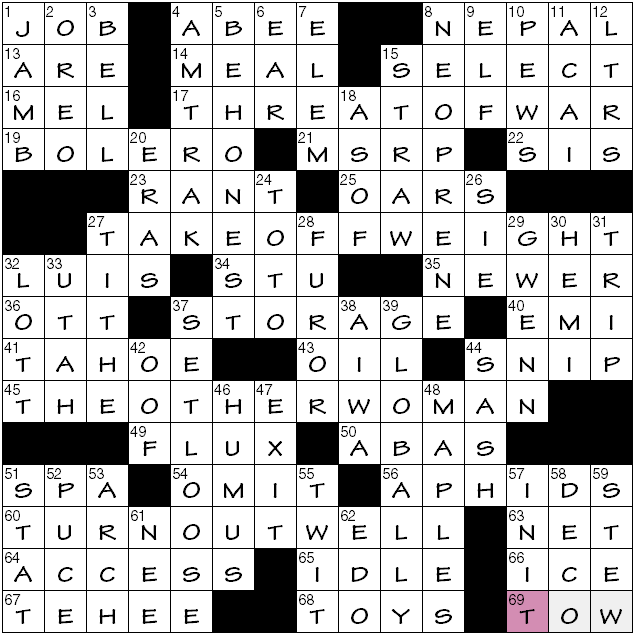 NYT: I do love a good movie puzzle, and this was it! Lots of proper nouns, but for me all Monday level and satisfying. I was glad to learn the correct version of the famous quote. Peter, sincere condolences on the loss of your father. (I read your note on XWord Info.) I’m impressed by what you said about how he followed your work. I was curious about what Rex said about this and paid him a visit just now. He complains a lot about a mis-quotation, and I didn’t see a correction of his mistake in the comments, though it might be there. Someone wrote in that he/she visited the Rex site just to check on the quotation, but a general search would have been better. I should have mentioned in my previous comment that the constructor’s comments were also in Deb’s Wordplay.